A former Canadian defence minister is urging humanity to abandon its warmongering ways and turn its back on atomic weaponry with the promise that advanced aliens will reward a more peaceful Earth with technological marvels and advancements in agriculture and medicine. And while it is hard to take seriously a message that appears to be a mash-up of every science fiction trope to be dreamed up since Gene Roddenberry was in short pants, let’s give the message a moment of thought. In a widely-shared interview with Russian Today, former defence minister Paul Hellyer said that he believed aliens were real, that they are present on Earth and that they would be more willing to help humanity if we stopped warring and polluting. “We have a long history of UFOs and of course there has been a lot more activity in the last few decades since we invented the atomic bomb,” Hellyer said. Hellyer first publicly declared his belief in aliens in 2005, long after he retired from politics. He says he has never met an alien, but has seen a UFO near his cabin on Ontario’s Lake Muskoka. 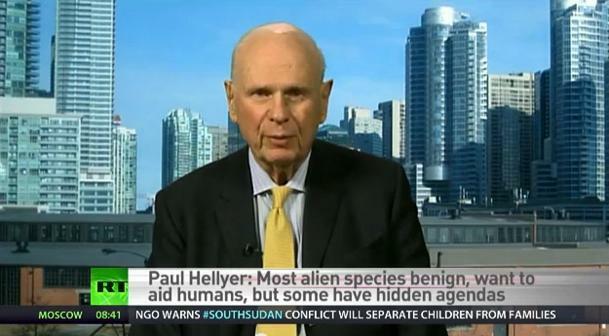 While Hellyer’s public belief in aliens is not new, it garnered fresh attention this week due to the overly descriptive and in-depth details he outlined on Russia Today. Most aliens come from other star systems, although there are some living on Venus, Mars and Saturn’s moon. There have been four species of aliens visiting our planet for thousands of years. Most alien species have benevolent intentions toward humanity, although a handful have ulterior motives. One alien species, known as the “Tall Whites” is working with the U.S. air force in Nevada and has been known to pass for humans in public. The “federation” of alien species has vowed not to intervene in human affairs unless they are invited to. The federation is disappointed in the way humans have treated the planet. Aliens technology is far more advanced. They have given us LED lights, microchips and Kevlar vests, but would be far more helpful if we weren’t warmongers. There are between two and twelve total species of aliens (although some place the number closer to 80). Some look just like humans, while others appear more like the creatures portraying in popular culture. “We spend too much time fighting each other, we spend too much money on military expenditures and not enough on feeding the poor and looking after the homeless and sick,” he said in the interview with Russia Today. Such an uninhibited declaration of belief in alien life is hard to ignore. It is also sadly hard to take seriously. It will leave most of us snorting in derision or guffawing out of incredulity. But let’s pretend for a moment that there is a 0.0005 per cent chance that Hellyer is right. That advanced alien life is here, that is it living among us and it is waiting for humanity to clean itself up before swooping in and sharing with us marvels of advanced medicine and agriculture (and, presumably, space travel). Would that be worth it? There is a simple logical exercise we should consider (borrowed from this video on climate change). Either Hellyer’s synopsis on alien life is correct, or it’s not. If it is correct and we abandon our warmongering ways, we are rewarded. If it is correct and we maintain our flawed course, we are left behind. However, if we abandon our warmongering ways and it is proven that he was totally wrong about alien life, we still find ourselves ahead of where we otherwise would have been. So, sure. We should be skeptical of the source and the details and the, erm, science fictional details. But at the core, the former defence minister of a G8 country is calling for an end to war. Humanity can either buy in to Hellyer’s interpretation of a Star Trek-ian alien federation and come together now, or wait for an evil genius to unite us by teleporting a giant squid into the heart of New York City, a la The Watchmen.